"You Can't Make Money Running Trains"
This piece takes its title from a maxim that Bernard Holden was apt to rely on from time to time. It was made with the general idea that railways are cost-heavy, and that for decades no railway had made profits while also renewing its capital infrastructure (sound familiar?). For the Bluebell Railway that adage remains as true today as it ever was, and while we must accept the truth of it, and model the business accordingly, we should know the cost of providing our primary product, in this case a single train or train service. After Bernard, finance directors David Foale and now Martin Widdowson put together a formula to help work out the cost of doing what we do, so that while the Railway may not make money, we shouldn't lose more than is avoidable. However, pinning down just what that cost is can be a tricky business. One has to decide what costs should be included in any calculation. So, we have been using a formula for a while now that covers some obvious direct costs, such as coal and oil, as well as a share of the cost of maintaining the fixed and rolling infrastructure, along with a share of salary costs. It is important to remember that this formula is based on figures that are reported in the company's accounts. And, of course, the service is entirely delivered by unpaid labour, which we don't quantify in terms of cost because the idea is to account for what share of the company expenditure goes on the train service. Furthermore, the formula is worked out on what our cash flow allows us to spend, rather than what we should spend. Because of both those caveats, we must be careful about how the formula is used. But it is a useful tool in terms of finding where the break-even point over input costs lies. The information that this calculation provides allows us to review our fare structure in a wider context than simply having a gut feeling about what the market will bear or looking at where our prices sit in relation to the heritage sector. As Chris Green was keen on emphasising at Network SouthEast, every ticket sale in the off-peak, given that the costs have already been incurred, is a straight addition to the bottom line. So, building on that idea, the formula allows us to calculate not only the cost of our product but also what level of ridership is needed to cover the cost of a single train or a complete service, and thus further the effect of every passenger over and above the break-even minimum. For example, at 2017 values, a Table One service train required 119 passengers daily in order to cover that day's costs; the Sulky Service, with four trains and based on those same values, needed to carry 152. This means that the Sulky Service required 2,532 passengers--an extra 628 over its 16 days duration compared with a Table One service--in order to break even. Therefore we have a bench mark with which to measure financial success: carry more than 2,500 passengers and you have not only covered the input cost but also have started to pay off some of the overheads into the bargain. Bernard was right to say we don't make money running trains, but nevertheless we should minimise the net loss on fares income in order to maximise the size of the cherry provided by the secondary spend. In truth, I think we could make money out of running trains with higher ridership, and then more renewal costs could be put where they belong, on the capital account. We cannot hope to do all we need to out of the revenue account, but we can ease the pain by running a well-patronised and cost-effective service. The financial tool I've described helps shine a light on what the finishing line should be. The major capital renewals that we currently try to fund out of revenue must wait for our capital funding gurus to work their magic. "Mac Lifter's" 16 March, 2018, Twitter photo shows the commemorative headboard for the "Sulky Special" and the 60th Anniversary of the closure of the Bluebell Line. The No. 80154 headboard is a reference to the very last East Grinstead-to-Lewes train that ran on 16 March, 1958, pulled behind No. 80154. A significant occasion in the history of the Bluebell Line, the last train marked the end of one era and the beginning of a new one, the line's rebirth as the Bluebell Railway. As part of 60th Anniversary events, in addition to recreating the historic journey of the last train on 16 March, the Railway is working with schools on a local history project. Visitors had opportunities to experience the Railway as it was in the 1950s, taking tea in '50s style, mini guided tours in areas not usually open to the public, and, for those born in 1958, travelling at 1958 prices: 4 shillings, or 20p! 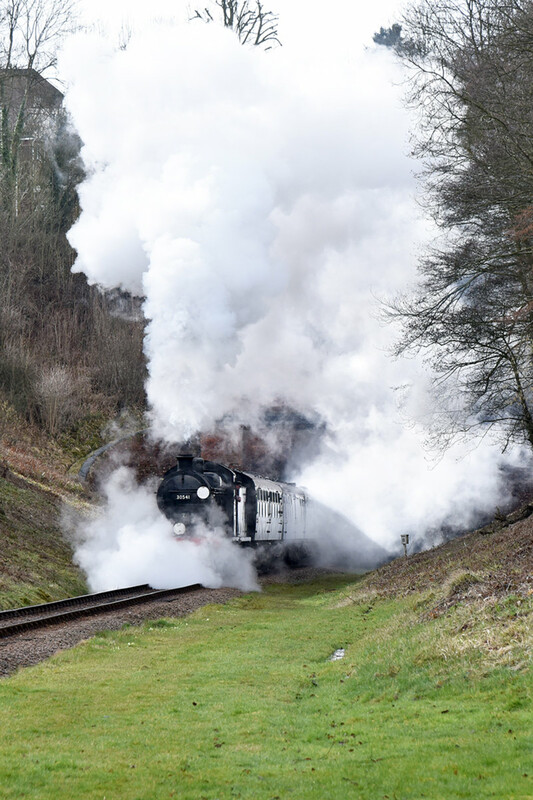 Julian Clark's photo shows the Q class carrying the commemorative headboard leading the ex Sheffield Park 9:30 a.m. "Sulky Service" train through a somewhat wintry scene on 16 March. Easyfundraising.com generates about £3,000 a year for the Railway, and it's a very useful source of funds. Now Amazon is offering a similar service for registered charities through Amazon Smile. When you purchase eligible items via smile.amazon.co.uk (instead of the Amazon's ordinary website), Amazon will pay 0.5% of the purchase (excluding delivery and VAT) to a charity you nominate. The prices and products are exactly the same as the ordinary Amazon website. The first time you access the Smile website, you will have to nominate the Bluebell Railway Trust, then this choice remains the same until you change it. Once signed up, if you use the ordinary website by mistake, you will be asked if you want to purchase through Smile. So if you like buying things on Amazon, please consider using Smile and nominate the Railway. Better yet, encourage your friends and family to do the same--every little bit counts! No. 45041 "Royal Tank Regiment" at Sharpthorne on the 09:00 ex Sheffield Park. No. 31271 "Stratford 1840-2001" leaves with the 11:00 ex East Grinstead. At the end of the day, class 46 D182 arrives at Horsted Keynes with the 5.30 pm from Sheffield Park. Let's not forget the Railway's own "Skippy"! To browse Keith Duke's photo album from 24 March, 2018, click here . Ben Jenden captured the gala on video on 24 March, 2018. As the spring bulbs boldly and bravely push their heads above the latest winter spell of snow delivered by the "Beast from the East", so Bluebell Railway reveals its new branding for its commercial business. The commemoration of the closure of the original Bluebell and Primrose branch line from East Grinstead to Lewes in March 1958 marks the start of the Bluebell Railway's series of 60th Anniversary milestone celebrations from 2018 to 2020. This represented an ideal opportunity for the Railway to review existing branding and logo and commission a local marketing agency to create a new corporate logo along with specific "Steaming to 60" elements to recognise the start of three years of anniversary celebrations. The brief to the agency was to maintain the nostalgia and heritage of the Railway whilst capturing the aspirations for the future. The existing logo has served the Railway well but a graphic rather than artist design was felt would add impact and aid replication in adverts, clothing and other marketing and promotional materials ... read more about the new branding here . 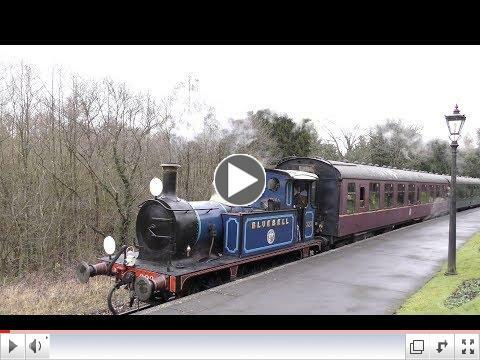 The Bluebell Railway's is Running a Maddest Hat Competition this Easter! To enter post a photo of your mad hat on our Facebook page or bring your mad creation with you on the day when you visit us for the Mad Hatters Tea Party on 30 March-2 April, 2018. There will be a daily winner who will receive a family ticket to the Bluebell Railway. Russell Pearce provided this photo of locos arriving for the Diesel Gala, with diesel-electric shunter No. 09018 in charge, on 19 March, 2018. Bob Pamment took these two photos of the Pullman Car 54 project. The left-hand photo shows the newly manufactured headstock for the north end of Pullman Car 54, while the photo on the right is the north end of the vehicle underframe waiting for the new headstock. Both headstocks on Car 54 had become distorted due to "mishandling" by previous owners. The requirement to lift the wooden body off the chassis in order to renovate the chassis gave us the opportunity to replace both headstocks. The buffing gear also had suffered from rough handling and several castings were cracked. The decision was taken to replace the buffing gear with items available from stock. The background to this decision was the chequered history of Pullman buffers and the knowledge that throughout its life, Car 54 would have had many buffer changes, one of which we know involved fitting oval buffers. These buffers were required as Car 54 ran behind the loco in and out of Waterloo on the "Devon Belle" and this modification prevented buffer lock on the tight curves. 25-29 May: Visit of No. 60163 "Tornado"
Charles Melton provides this photo of a resplendent, and very nearly complete, canopy at the Bessemer Arms at Sheffield Park. Well done to all the Friends of Sheffield Park. "The remaining 'small' tasks are taking somewhat longer to complete than anticipated, so we won't be signing it off as complete for Easter, as I had hoped," explains Chas, "but it is already effectively in use, and one visitor who hadn't seen it previously admitted today that he hadn't actually noticed it. I will take that as an accolade, not a slight!" The Camelot Locomotive Society's CCT S2531 was moved back into the Carriage & Wagon works a few weeks ago, and this has enabled good progress to be made on the van. Large parts of the underframe and the metal stanchions supporting the roof are now painted in red primer, following rust treatment, and the brake gear is progressively being dismantled for similar work. Work has started on the construction of four pairs of new side doors, the first of which can be seen in one of the photos. To mark the spring Diesel Gala, Tony Hillman has picked out these diesel photos from the Colin Hogg and John J. Smith collections. No. 10201 near Woking on the down West of England train, 1952 (Colin Hogg). An album covering the anniversary of the Bluebell Line closure on 16 March, 2018, taken at Horsted Keynes by Neil Munro-Thomson. Brian Lacey's photo shows Q class No. 541 bursting out of the tunnel with a School Special on 16 March, 2018. John Sandys (13 March, 2018): "With the scaffolding down from the canopy, it is looking magnificent and a real credit to the work done by the friends of Sheffield Park and Colin the contractor!" John Sandys (22 March, 2018): "Featuring Camelot out on a test run today after its overhaul and further work on the ASH and canopy projects." The Cavan & Leitrim Railway (C&LR) was a narrow-gauge railway in the counties of Cavan and Leitrim in the north-west of Ireland. The railway opened in 1887 and was closed in 1959. Unusually for Ireland, this three-foot-gauge line survived on coal traffic, from the mine at Arigna. It outlived most of the other Irish narrow-gauge lines, giving a further lease of life to some of their redundant engines. The line consisted of a main line 54km long between Dromod and Belturbet with a 24 km branch from Ballinamore to Arigna. At its opening the C&LR had a stock of eight steam locomotives, all of the same wheel arrangement and built by Robert Stephenson & Co.
Today 0.4 kilometers has been restored and remains preserved. A museum was established in 1993, run entirely by volunteers, located beside the Irish Rail station in Dromod on the grounds of the old C&LR yard. 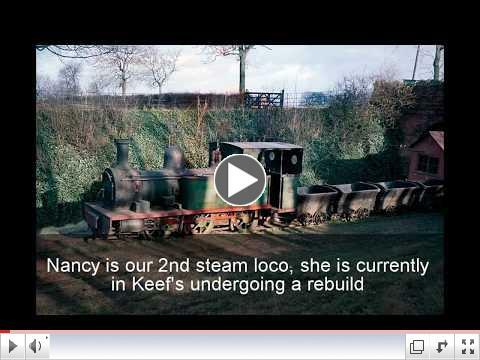 The related "Nancy" Restoration Group project was founded as a joint effort by volunteers on a number of Ireland's narrow gauge railways, with the ultimate goal of returning Avonside-built "Nancy" to steam. Bob Kershaw: "Shot on 10 March, 2018. The mixed traction gala was unfortunately cancelled, but there was still a heritage train service. Visiting 0-6-0 P class tank No. 323 "Bluebell", worked top-and-tail with resident class 33 diesel No. 33063 'R. J. Mitchell' (designer of the Spitfire) on trains running between Tunbridge Wells and Eridge. "The sequences were shot at, and close to, High Rocks station and at Eridge. The first scene at Eridge was interesting to say the least, when the Southern Rail train was fortunately faster than the branch line one." Up until the 1970s, a visitor approaching Buckley from the east would have observed a vista of smoky haze, pierced by dots of fiery kilns. These represented the numerous brick kilns which gave the town a worldwide reputation for its production of bricks, fire-clay refractories, and pottery. The Buckley Railway chugged up and down the line to Connah's Quay Docks, and steam traction wagons competed with increasing road traffic. Planning a getaway? The Sheffield Park Hotel Package includes a special overnight stay, fine dining, steam travel and a day at any of the following: Borde Hill Garden, Wakehurst Place, The Priest House in West Hoathly, Sheffield Park Garden, or Standen House & Garden. 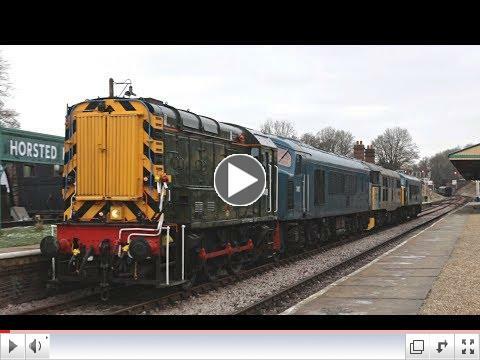 Mike Anton shot this video of the diesels' gauging run, pulled by the 09, at Horsted Keynes on 19 March, 2018. A system for examining the condition of rails to determine the integrity of the steel. The data is collected by an electronic instrument run along the track Also used to detect flaws in railway axles. The Railway welcomes coach and organised groups of any size with plenty of discounted rates and options available to you. Group bookings must consist of 15 or more passengers to be able to reserve seats and get the discounted group rate. A guard signalling at East Croydon station, London, April 1964. He is wearing a new-style British Rail uniform. 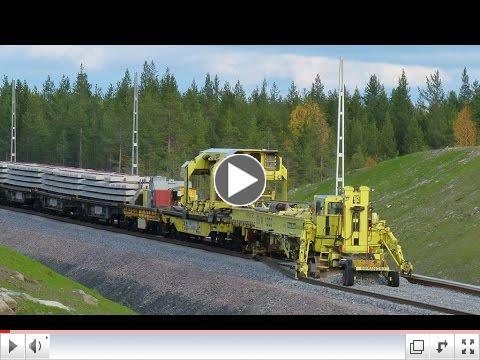 The Bluebell Railway has been doing some track re-laying recently, but they didn't have the services of the "world's largest track layer," the Plasser & Theurer SVM1000, seen here in 2011 laying new track in Sweden. Have a question for the Railway before your visit? Check out the FAQs page . A fire fighting demonstration using an Southern Railway 0-6-0 tank that has been fitted with water pumps for fighting railway fires. The firemen attach hoses to the pump and spray water off to the side of the track. At the @bluebellrailway Diesel gala this weekend, look out for our stall at Horsted Keynes. Come buy things and enjoy some diesels too! SECR Coach Update: 3 working members of the @bluebellrailway came down this Sunday, and dismantled what was salvagable from the coach. Alas, while the body is too far gone, I'm pleased the parts they acquired will be of use on the Railway's other SECR coach restoration projects.